Majority of the users must be using their little Raspberry Pi computer headless (without any keyboard, mouse or display attached), and while SSH is a great option for Linux users feeling comfortable with command line other users need an graphical user interface. Here is an quick tutorial to remotely access your Raspberry Pi's desktop remotely over an network. There are many VNC server options available but I prefer X11VNC as it provides access to the same LXDE desktop session as live on RPi, unlike tightvncserver which creates a new virtual desktop session for each connection. To install X11VNC server SSH into your RasPi and use - sudo apt-get install x11vnc. Now use x11vnc -storepasswd and set your VNC access password. Now, we need to make X11VNC server start with LXDE, to do that use following commands at terminal. Save the above file by using - Ctrl-X, Y, in nano. This will auto start our VNC server every time LXDE starts, make sure you have "Boot to desktop" option configured using "sudo raspi-config" to get this working flawlessly after reboot. By default X11VNC uses lower resolution, uncomment hdmi_force_hotplug=1 in /boot/config.txt followed by an reboot to fix that. Now, we have configured our VNC server. To access this server remotely we need an VNC client, on Windows UltraVNC is my client of choice. Simply, enter your RasPi IP address and connect. Thank you very much this worked perfectly. Thanks this worked out great, only thing is the window is small. Is there a way to get it larger other than full screen? 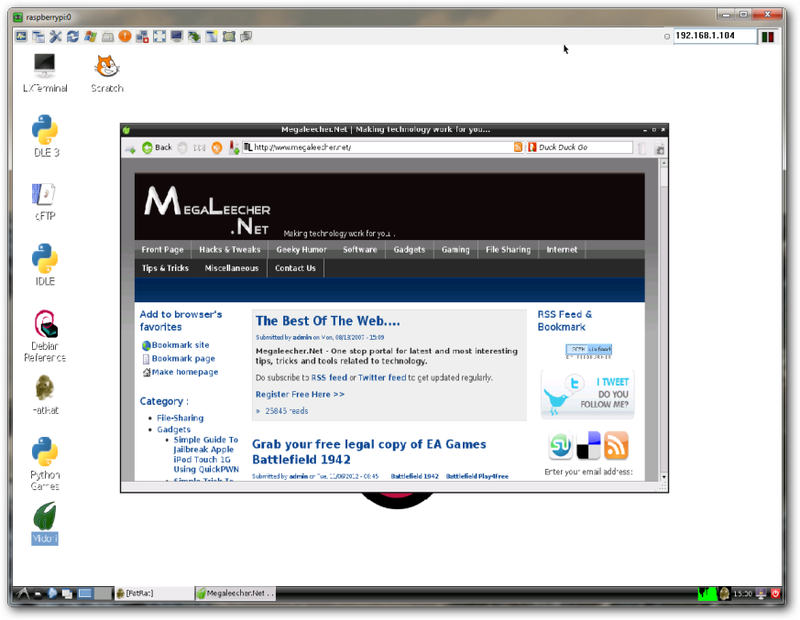 It does not seem to allow me to resize the window using Chicken of the Sea VNC viewer on a Mac. Try testing different resolution settings to get desired size. -geometry in them but have not gotten it working yet. Okay I got it, I saw what you had in Step 8 and that resolved the issue. every time I use "x11vnc -storepasswd", my PI says "Illegal Instruction". I have a PI model B. Thanks for this tutorial, finally got my little Pi Server working the way I want it to! I worked for 2 days searching the web, trying all kinds of things from installing tight vnc server and configuring in all sorts of way to installing x11vnc, but starting it incorrectly. This did exactly what I needed. REMOTE INTO THE CONSOLE SESSION of the PI!!! Thank you much for posting. Excellent documentation. Thx for the help. but i have a little problem here, the auto start don`t work, i upgrade the system, remake all the steps but every time i start the rasp i have to click in the VNC shortcut i created and select the port, the type of connection and set the password... can anybody help? I have followed the tutorial and I can run vnc manually and it works, but it is not auto starting.